The very funny Game Night belongs to the comedy sub-genre of People Think They're Pretending But It's Actually Real, a class that includes such fine entries as ¡Three Amigos!, GalaxyQuest and A Bug's Life—which are all pretty much the same movie—plus Tropic Thunder and the under-appreciated Bill Murray entry The Man Who Knew Too Little. The key to making a plot like this work is to not let the oblivious parties remain oblivious for longer than the audience can believe, which depends on how clueless you've established the main characters to be. It's trickier when they are smart, though it's potentially funnier to see a smart person—especially a smug one—be deceived. That's what Game Night achieves. 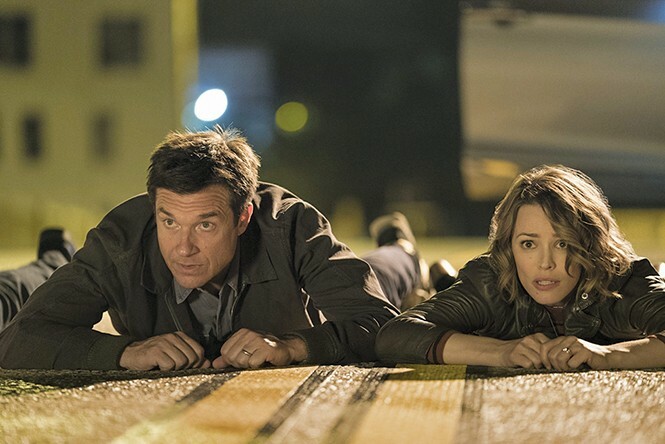 Directed with surprising visual flair by John Francis Daley and Jonathan Goldstein (the Vacation reboot duo) from a screenplay by Mark Perez (Accepted), it focuses on shrewd, competitive married couple Max (Jason Bateman) and Annie (Rachel McAdams), who met at bar trivia and have made board games a regular part of their lives. They host a weekly gathering to crush their opponents/friends, attended by fellow marrieds Kevin (Lamorne Morris) and Michelle (Kylie Bunbury), and singleton dummy Ryan (Billy Magnussen) and his rotating series of Instagram-model dates. One night, they are spontaneously joined by Max's older brother, Brooks (Kyle Chandler), a jet-setting entrepreneur who makes Max feel inferior and has a lifelong track record of beating him at everything. Brooks has arranged for the group to play an immersive murder-mystery game, where actors would come to their house and "kidnap" one person, then the others compete in deciphering clues to save him. But wouldn't you know it, actual kidnappers show up and have a knock-down, drag-out fight with Brooks before dragging him away in front of the three couples, who are impressed by the authenticity of the fight and eager to start sleuthing. The pairs work separately for a while, each twosome pursuing a different wrong path to solve what they have not yet realized is a real kidnapping. Max and Annie, normally a great team, start to unravel under the pressure, culminating in a hilarious scene where they must tend to a wound while bickering and fighting back nausea. There's great comic potential in intelligent people thinking they have the upper hand when we know they don't, and Bateman and McAdams—he with his smugness, she with her confidence—are perfect for it. Kevin and Michelle's mini-thread is his discovery that she once cheated on him with a celebrity, which he obsesses over endlessly and which ultimately pays more comic dividends than you'd expect. And Ryan, that gleamy-eyed fool, has brought a ringer as a dateon this particular night, a co-worker named Sarah (Sharon Horgan) who's smart but doesn't like him. The reality of the situation becomes clear soon enough, and the six players set out to rescue Brooks, whose trouble with organized crime is what led to this whole ordeal and leads to the plot of the film getting so big it almost derails. It's held together by the cohesive group of characters; they can be snippy with one another, but they always revert to affectionate teamwork before the mood grows caustic. The comedy gets dark, occasionally involving violence and pain, but it's never nihilistic or mean-spirited. You see that basic good-naturedness in a jaunty, well-choreographed sequence where the players cooperate to keep a Fabergé egg out of some bad guys' hands (it's a long story), and in the film's treatment of Max and Annie's next-door neighbor, Gary (Jesse Plemons), a sad-sack police officer who was a regular game-night attendee until he and his wife divorced and he stopped being invited. Established first as an object of scorn, the humorless Gary comes to be a sympathetic character whose amusing idiosyncrasies endear him to us and his neighbors. It helps that Plemons is clearly enjoying himself, giving a performance that's loopy and weird but always under control. The whole cast has that infectious can-do attitude, resulting in an unexpectedly sharp, upbeat action comedy.